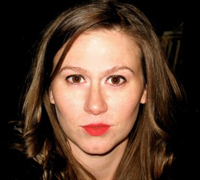 Amanda Montei holds an MFA from California Institute of the Arts and is a PhD candidate and Presidential Fellow in the Poetics Program at SUNY Buffalo. Critical writing has appeared in Gurlesque: A Critical Anthology (Saturnalia, 2016), Performing Ethos: An International Journal of Ethics in Theatre & Performance, PAJ: A Journal of Performance and Art, American Book Review, Harriet: The Blog, Ms. Magazine, HTMLGIANT, and others. Her poetry and fiction has appeared in Dusie, Atlas Review, Everyday Genius, Coconut, Gigantic, Joyland, Pinwheel, Explosion Proof Magazine, Delirious Hem and others. She coedits Bon Aire Projects, and edits the literary journal P-QUEUE. She is co-author, with Jon Rutzmoser, of DINNER POEMS (Bon Aire Projects, 2013), and author of the chapbook The Failure Age (Bloof Books, 2014).